R Ideas Specialty Boxes JV supplies boxes that are quick and easily assembled. Our boxes are made to ensure superior quality and durability. The products we offer are are highly perceived and eco - friendly. Pop Up Gift Boxes are easy to assemble! One Piece POP UP gift box; no tape or scissors required. Constructed of 800-1200 pound paperboard; twice as thick as normal gift boxes. Exterior and Interior has textured finish. Includes magnetic and adhesive closures. Includes two elastic bands to secure bottles in place; one small top, one large bottom. Includes protective bottle dividers for two and three packs. Boxes ship flat; individually wrapped to prevent marking. Boxes available in four sizes: Single bottle, Magnum single bottle, Two bottle, Three bottle. Boxes available with COLORED paperboard SLEEVES in Red, Hunter Green, Gold and Silver. Sleeves have gloss finish designed for printing and hot-stamping. Boxes available in custom colors. Minimum order requirement for custom boxes 5000 pieces per style. 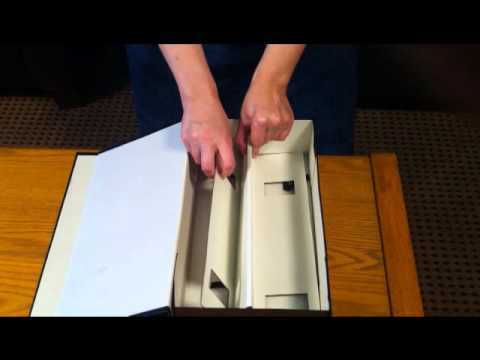 Simply fold the box and remove the wax paper from strong adhesive corners; apply pressure and close the magnetized lid. The box contains bottle bands at top and bottom to conveniently secure bottle in place. Cal Poly mascot has been hot-stamped in green on gold sleeve from R Ideas. Box sleeve colors include gold, silver, red, green. A company logo sticker may also be used on box sleeves. With bands to secure the bottles. Gift boxes are made with extra sturdy 1600lb paperboard to accommodate wine bottle weight. Heavy ivory bottle separtor and bottle bands inside top and bottom of box secure bottles in place. Tissue or novelty grass may be added for enhancement of bottle labels. Boxes ship flat in case of 24. Flat shipping allows boxes to easily be foil stamped with company name or logo. Flat shipped boxes make it easy to foil stamp your company name. Our three bottle gift boxes are extra sturdy to accommodate weight of three wine bottles. Bottle separator and bottle bands at top and bottom secure bottles in places. Tissue or novelty grass can be used to enhance wine labels. Box sleeves are available to add a pop of color to outside of box. Three bottle boxes are case of 12 each. Our factory can entertain custom gift box orders for minimum quantities of only 2500 units per style box! If our Pop up line of gift boxes are not for you, we can entertain requests for all vertical & horizontal style gift boxes! An ideal color for the California wineries! Available in packages of 24 each-perfect for hot stamping customization! Retail Single Pop up gift box package, includes an attractive gold box sleeve! Excellent impulse sales items for ones tasting rooms or in beverage sections of grocery stores! Customize all sizes of our pop up wine gift boxes with your winery or corporate logos! Perfect way to introduce a new varietal to your customer base! These rigid black leatherette wine boxes offer state of the art manufacturing and include a hidden magnetic closure, and they are super easy to assemble. Boxes made by R Ideas Specialty Boxes JV. WINE GIFT BOXES FOR ALL OCCASSIONS!!! Finally, Sun and Springtime has arrived !! one bottle, two bottle, three bottle and even in Magnum size! information about our products! We look forward to hearing from you! Yes, we are still in stock on all sizes of our folding Gift boxes: 1pks,2pks,3pks, Magnums-Bottle dividers "included" with two and three packs! We offer direct to winery pricing with NO minimum order requirements! Quick delivery times from our Sonoma warehouse. Additionally our factory has the ability to design and produce all types of quality custom wine gift boxes at extremely competitive delivered pricing, with a quick turn around time! We are most creative and easy to work with! The time is approaching for many wineries to introduce new varietals of wines to the marketplace; so we are available to work with you in order to provide your winery with the ideal gift box to highlight your fine wines! Please contact us directly for pricing on our line of gift boxes. Give the gift of wine in our attractive and easy to assemble gift boxes. Cover all your wine gifting needs by choosing from single, double and three bottle boxes, including a magnum and sparkling box. Boxes are sold by the case of 24 for single, two bottle, and magnum sizes; 12 boxes in a case of three bottle. No minimum case purchase requirements. Gold and silver box bands can dress up your wine gifts. See you at the Trade Show & Conference on December 6. Come by Booth #522 to check out our products and #ExpoDeal: 15% off gift boxes case price, including discount shipping day of show. Thanks for stopping by. Unique Folding Gift Boxes for Holiday Promotions! Well, we are rapidly approaching the 2018 Holiday Season. So it is now time to prepare for your winery's promotional sales! gift boxes. No minimum order requirements! for additional product and pricing information. We are now full bore into the summer season! Many visitors are frequenting all wineries around the country! and easy to assemble wine gift boxes. All boxes store flat! We are still in stock on all sizes: 1pks, 2pks, 3pks and Magnums! Our two and three bottle gift boxes, include bottle dividers. If you wish to customize our gift boxes, hot stamping is a great option!! First come, first serve, so the time to order now! Summer time is upon us, which means that the crowds will begin to flock to all the wineries. and Magnum size gift boxes. We do have direct pricing terms ancd conditions available to our winery customers. Minimum order quantities will not pose a problem! Good Selling and we hope to hear from you soon! Introducing new varietals to the market this year? Many wineries will be introducing new varietals to the market that many require an attractive gift box. Additionally, our factory has a very quick turnaround time for the development and production of all types of wine gift boxes; so if your needs mandate a custom printed wine gift box, we can address all of your requirements! STILLTIME TO STOCK UP FOR THE HOLIDAYS! We are in stock of all our unique line of POP UP GIFT WINE BOXES! So it is still not too late to order for the upcoming holidays! We will continue to offer our special discounted pricing of 15% off to the wineries, includesFREE" shipping throughout California. Again no minimum orders required! 1pks, 2pks, 3pks and Magnums. Do NOT miss out on this great opportunity! Gold and silver box sleeves for decorative and customizing possibilities. Come stop by booth number 520 at the upcoming North Coast Wine Expo as we will be offering a show special on all direct to winery pop up gift box purchases through the month of December! It is now time to prepare for the upcoming 2017 holiday season! Our shipment of unique pop up wine gift boxes will be landing at our Sonoma warehouse in a few weeks! So we will be in full stock on all sizes: 1pks, 2pks, 3pks and magnums, plus silver and gold box sleeves which are ideal complements to all gift boxes. Our gift boxes are attractive, easy to assemble and priced to sell, so suggest you get your orders into us as soon as possible! As one likes to say the "early bird catches the worm". We look forward to hearing from everyone. Samples can be provided upon request. GET READY FOR THE UPCOMING HOLIDAY SEASON! BE LANDING AT OUR SONOMA WAREHOUSE IN A FEW WEEKS! PLUS SILVER AND GOLD BOX SLEEVES WHICH ARE IDEAL COMPLEMENTS TO ALL GIFT BOXES. OUR GIFT BOXES ARE ATTRACTIVE, EASY TO ASSEMBLE AND PRICED TO SELL! WE SUGGEST YOU GET YOUR ORDERS INTO US AS SOON AS POSSIBLE! AS ONE LIKES TO SAY THE "EARLY BIRD CATCHES THE WORM"! WE LOOK FORWARD TO HEARING FROM EVERYONE. SAMPLES CAN BE PROVIDED UPON REQUEST. LOOKING FOR THE RIGHT WINE GIFT BOX! WELL THE DROUGHT IS NOW BEHIND US! WITH GREEN PASTURES AND FLOWERS BLOOMING! SO THE CROWDS OF VISITORS TO THE WINE COUNTRY SHOULD BE QUITE PLENTIFUL THIS YEAR! WITH OUR UNIQUE LINE OF GIFT BOXES; ATTRACTIVE AND PRICED TO SELL! WE ARE STILL IN STOCK ON ALLS SIZES: SINGLES, TWO & THREE PACKS, PLUS MAGNUMS! FIRST COME, FIRST SERVE! SO WE SUGGEST YOU PLACE YOU ORDERS NOW! FOR FUTHER PRODUCT INFORMATION, PLEASE REVIEW OUR WEB PAGE. COME VISIT US AT BOOTH #520! The upcoming North Coast Wine Industry Expo (WIN EXPO) is right around the corner. We will be exhibiting many existing and new products at booth #520! Please stop by so you can review many new wine gift boxes and wine bags, which can be produced for the upcoming 2017 season! First serve basis", directly to wine related accounts. We are looking forward to seeing everyone at our booth on 12/01/ 2017! A happy and safe upcoming holiday season to all! Our container of all size pop up gift boxes has arrived! We are offering our products on a direct basis to wineries! Please come visit our booth #520 at the December 1, 2016 North Coast Wine Expo! We will be exhibiting many different types of wine gift boxes that can be customized to one's requirements! Additionally at the show we will be offering a 15% discount off our regular direct to winery pricing! So take advantage of our special price offering for our unique line of POP UP GIFT BOXES! THE HOLIDAY SEASON IS RAPIDLY APPROACHING! Well the harvest is in full swing, which means that the Holiday season is right around the corner! So now is time to address your winery's holiday gift box requirements for both tasting room and wine club member sales. PLUS OUR GIFT BOXES ARE PRICED TO SELL AND IDEAL FOR ALL SIZE WINE AMD CHAMPAGNE BOTTLES. Our wine gift boxes are available in Single, Double, Triple and Magnum Bottle sizes. Our Two and Three Bottle gift boxes include dividers. as is the case with our boxes! Our container will arrive in two weeks, so we will be in full stock on all gift box sizes!! Please give us a call or send us an email with your requirements plus any questions! STILL POP UP GIFT BOXES AVAILABLE! Summer is here and the crowds are filling up the tasting rooms! Many new varietals have been bottled and wineries are seeking out some packaging strategies to highlight their wines! wine club customers. Our boxes are easy to assemble, yet durable and quite attractive! All our gift boxes, including box sleeves can be customized to your needs. Furthermor, Custom gift box pricing is also a possiblity--BUT--Minimum order quantities must be met! We do offer direct to winery pricing! We are a local Sonoma company and stock current inventories in all sizes: Single, Two, Three and Magnum bottle sizes. Order today for immediate delivery. Also It is NEVER TOO EARLY to prepare for the 3rd and 4th quarter promotional holiday seasons. We look forward to assisting you with your wine gift box requriements!! Good selling and please check out our web page for additional product information! As we enter the summer season, this will prove to be a very busy time of the year for all the wineries! So it is now the time to prepare for your 3rd and 4th quarter holiday requirements. We will always have in stock in our Sonoma Warehouse of our black alligator finish POP UP GIFT BOXES in single, two, three and magnum bottle Sizes. The ease of assembly and high perceived value are just two of the attractive attributes of our product line! But for those wineries who are interested in a custom style POP UP GIFT BOX or for that matter any other type of gift box, such as a vertical style box, we need to factor in 60-90 day lead times from our China Factory. Our Minimum Order quantities have been reduced from 5000 boxes to only 2500 boxes, so we are seeking new customers!! Please review the different style gift boxes ,we have referenced on our web page, under the pictures and products "links"! BUD BREAK IS UPON US! I AM SURE MANY WINERIES ARE NOW FOCUSING ON THE INTRODUCTION OF THEIR NEW VARIETALS! WHICH ARE AFFORDABLE, ATTRACTIVE AND EASY TO ASSEMBLE! YOU CHOOSE YOUR TYPE OF GIFT BOX, PAPER FINISH, POST PRINTING REQUIREMENTS, PROVIDE US WITH YOUR ARTWORK AND WE DO THE REST! OUR MINIMUM ORDER QUANITITIES AND PRICING ARE QUITE REASONABLE! PLEASE CONTACT US FOR FURTHER PRODUCT AND PRICING INFORMATION. SPRING TIME IS RIGHT AROUND THE CORNER! Yes we all love the rain and we certainly need it! anxious to taste the new varietals that are available at many of the tasting rooms! Plus, we have many holidays on the horizon, where Wine would make a wonderful gift! and Magnum sizes and YES WE STILL HAVE STOCK IN OUR SONOMA WAREHOUSE FOR IMMEDIATE SHIPMENT. Please contact us for our "SPECIAL" direct to winery pricing and further product information! What better way to surprise your special valentine partner than with a wondeful bottle of wine packaged in our decorative pop up gift boxes! We still have ample stock of our single, two, three and magnum size wine gift boxes, along with decorative Lavendar, Gold, Silver and Red Box Bands! All our products are warehoused in downtown Sonoma and are available for immediate shipment! PLUS we will pick up the freight!! Contact us now for product and pricing information!!! TAKE ADVANTAGE OUR 2015 HOLIDAY PROMOTION!!! Well the Holiday Season has now arrived! If you have not already placed your Pop up gift box orders with us, suggest you do so, ASAP! We are in stock on all items, but inventories are moving fast! Please contact us for pricing and product availablity information! As a further incentive, we are offering FREE SHIPPING through the end of this year! line of wine gift boxes, which can be customized to meet your taste and requirements! Yes it is a very busy time of the year for all of us involved in the wine business! So one must always plan ahead or we may be left out of the game. certain sizes seem to be more in demand this season than in prior years, so our endeavor to stock according to forecasts/prior year sales does not always work out well. So PLEASE get your orders in, as soon as possible, so you have ample supplies of our wonderful gift boxes for the upcoming holiday season! NEVER TOO BUSY TO PLAN AHEAD! With Harvest beginning earlier this season, coinciding with the introduction of many new wine varietals it is a very, very busy time of year for all in the wine industry! BUT it is also very important to begin to prepare for your 4th quarter holiday needs! So best to get your POP UP GIFT BOX orders in with us as soon as possible! Once you try our unique line of wine gift boxes, whose elegance is only surpassed by their ease of assembly and storage, you will become a loyal customer for years to come! Again, we are NOW BACK IN STOCK ON ALL SIZE POP UP WINE GIFT BOXES: SINGLE, TWO, THREE PACKS AND MAGNUMS! Magnum gift boxes are not easy to source, so take advantage of our offering! As a reminder, we do entertain custom box requests, but minimum order quantities must be met and expect at least 60-90 day lead times from receipt of purchase order! Well we have just received in our annual shipment of Pop up style wine gift boxes! It is never too early to begin to prepare for your upcoming holiday gift box requirements! in a high quality gift box provided by R Ideas Specialty Boxes. We are now back in stock in all gift box sizes: SIngle, Two, Three and Magnum Bottle packs. along with our NEW LAVENDER COLOR SLEEVES, ideal for wine country promotions! As a reminder both our boxes and box sleeves can be imprinted with our respective wiinery or corpoate logos! Please contact us for further product and pricing information! TIME TO GET READY FOR THE HOLIDAY SEASON!! Our Unique line of gift boxes are available in single, two, three and magum wine bottle sizes—high end quality gift boxes at affordable pricing plus ideal for wine club shipments—PLUS—excellent tasting room impulse item with retail single gift box with gold box sleeve for holiday appeal—can be pegged on a hook for sale or available in 24 unit counter display. Dress up your fine wines with our high end gift boxes! Stop by our Booth #706 at the upcoming North Coast Wine Industry Expo on December 4, 2014! Receive a Free gift box sample, Enjoy a glass of vino while you review our complete line of wine gift boxes, which can be customized to meet your taste and requirements! We will be exhibiting at the North Coast Wine Expo on December 4, 2014! Stop by our booth #706 and ask for a Free sample of our unique wine gift boxes. We'll be running our FREE SHIPPING PROMOTION through December 31st! This represents a great savings to our customers and a good time to try out our beautiful wine gift boxes for your holiday wine gifts. We'll demonstrate the ease of these sturdy boxes which 'POP-UP' for super fast assembly. We'll show you the strength of the construction of these boxes which can easily bear the assembly the weight of one, two or three wine bottles in one box. We also have a Magnum/Sparkling Wine sized gift box. For a splash of color to the outside of these beautiful boxes, we have colored sleeves to compliment your ready to go gift. These boxes and sleeves can also be hot stamped or printed! This year we will also be displaying a full array of suggested custom designed gift boxes which may provide you with some ideas for future gift box requirements; available for only minimum quantites of 2500 per design! Contact us about your gift box needs!! 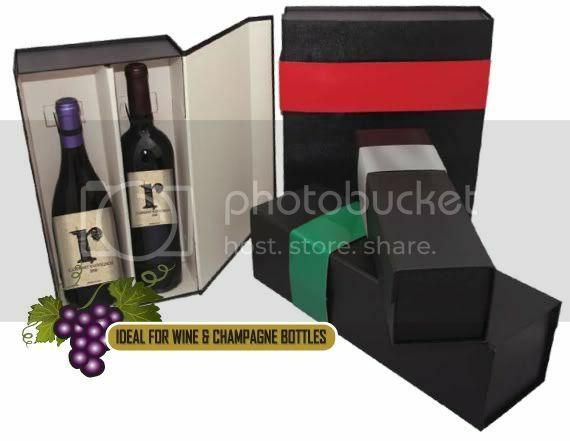 SPECIAL 4TH QUARTER PROMOTION: UNIQUE WINE GIFT BOXES TO ENHANCE YOUR HOLIDAY WINE SALES!!! Our superior constructed wine gift boxes are available in single, double, triple, and magnum wine bottle sizes. These high-end quality boxes will add value to your beautiful wine and wine labels. Affordable pricing for your wine club, tasting room, or special customers. For your tasting room and impulse buyers we offer a retail pack that can easily be displayed pegged on a hook or in a counter display. Case count is 24 units. Each cello wrapped package includes one single bottle box and one gold box sleeve. All boxes are black exterior with alligator-embossed finish and elegant ivory interior. Double and triple size boxes include well-constructed bottle separators that fold accordian style between bottles. All boxes have bottle bands at top and bottom of box to secure bottles in place. All boxes sold by case of 24 each except triple bottle size which is 12 each. No case minimums! Quick and Easy to Assemble! We have attractive box sleeves which add a pop of color to your black box in red, silver, gold, green. Novelty tissue and grass can be added to box. All boxes ship flat and can be foil stamped with your logo or company name. The box sleeves can also be hot-stamped or a sticker with your logo can be added. Please see our "Pictures" section for more ideas. Getting ready for the upcoming holiday wine buying season? As we all know, time is money! 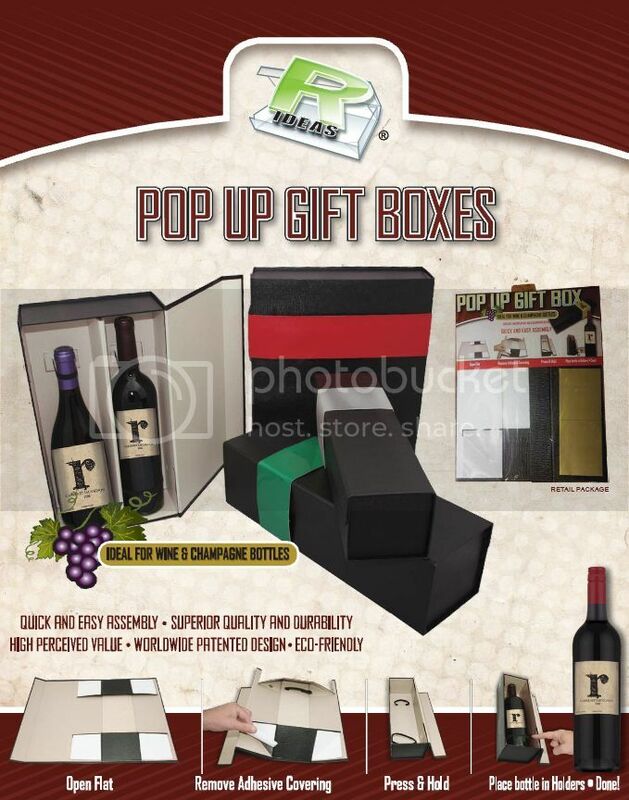 Avoid the hassels associated with the difficulty in assembling gift boxes in your busy tasting rooms by utilizing our unqiue line of pop up wine gift boxes: One Piece Pop up Gift Boxes, Quick & Easy Assembly, Store Flat, include magnetic and adhesive closures. Our boxes may also be printed with your winery's logo or try our seasonal color box sleeves with gloss finish designed for printing and hot stamping. R Ideas Specialty Gift Boxes are available in four sizes: SIngle Bottle, Two Bottle, Three Bottle and Magnum. All include two elastic bands to secure bottles in place' two and three packs include protective bottle dividers. Once you try our gift boxes for your holiday seasonal wine sales, including those to your wine club customers, we are certain they will become an everyday stable for your winery's packaging needs!! WILL YOU BE INTRODUCING A NEW VARIETAL & VINTAGE TO YOUR CUSTOMERS? As we know first impressions are very important! So introduce your new fine wine, packaged in our unique line of pop up wine gift boxes! Our gift boxes are elegant in design, yet durable, plus easy & quick to assemble. One piece gift box, with exterior and interior textured finish! Available in four sizes, with colored paperboard gloss finished sleeves, which can be hot stamped or printed for any occassion! R Ideas Specialty Gift Boxes are an ideal complement to your fine wines. GREAT SELLING MARGINS FOR WINERY TASTING ROOMS! Boxes are available in single, two, three and magum wine bottle sizes—high end quality gift boxes at affordable pricing plus ideal for wine club shipments—PLUS—excellent tasting room impulse item with retail single gift box with gold box sleeve for holiday appeal—can be pegged on a hook for sale or available in 24 unit counter display. An excellent holiday impulse item for your tasting room with strong profit margins! Ideal for Wine & Champagne Bottles - our pop-up Gift Boxes have a worldwide patented design, are eco-friendly, and have superior quality and durability. Our new 24 unit single box counter display takes up very little counter space, and can easily be added to your existing product line. Use the “Send Me Info” button on the left to send us your contact information, or send an email toRideas.custserv@comcast.net for more information. Contact Us for Current Pricing, or click the "Send Me Info" button to send us a message and request more information.